The Settlement will pay eligible owners of residential real property identified in the area indicated in the map below to settle claims related to alleged loss of use and enjoyment, and other property damage, as a result of the presence of the chromium sites and alleged related hexavalent chromium contamination. The payments will be made in exchange for agreement to a release of claims against Honeywell as more fully set forth in the Notice. On May 17, 2010, three plaintiffs filed this lawsuit on behalf of themselves and as the representatives of a class of similarly situated persons, asserting nuisance and other claims, alleging their properties have been adversely impacted by a chrome ore processing plant and the generation, disposal and alleged historical failure to properly remediate hexavalent chromium contamination and COPR within the Settlement Class boundaries and at several locations along Route 440 in Jersey City known as Study Areas 5, 6, and 7 and Site 119. The COPR and alleged related hexavalent chromium contamination came from a chromium manufacturing facility formerly operated by the Mutual Chemical Company on Route 440 in Jersey City, New Jersey from 1895 until 1954. These three plaintiffs alleged that the generation, disposal and historical failure to properly remediate these chromium sites and associated contamination caused a loss of use and enjoyment, and other property damages to properties in the surrounding neighborhoods. The Settlement requires Honeywell to place Ten Million Seventeen Thousand Dollars ($10,017,000) into a settlement fund to be distributed (after payment of certain expenses) to eligible Class Members. The Settlement provides for a monetary payment to the owners of each eligible property in Class A and Class C. The exact amount of any final payment to the property owners will depend on the Court’s award of attorneys’ fees and expenses, costs of administration, and the number of eligible members participating. However, if all eligible properties participate, it is estimated that each eligible property would receive approximately $1,850 in payment. Two different areas of residential properties are covered in the settlement: “Class A” and “Class C.” Class A comprises an area within the vicinity of the former Mutual facility on Route 440. Class C generally comprises the residential development known as Society Hill, located to the West of Class A. If you owned residential property in Class A or Class C during the period May 17, 2010 through October 1, 2014, you may be entitled to receive a settlement payment. Please see the map below to determine if your property is covered by the Settlement. The area of the properties covered in Class A is generally bounded by Kellogg Street between the Hackensack River and Society Hill Drive North; Society Hill Drive North between Kellogg Street and Danforth Avenue; Danforth Avenue between Society Hill Drive North and John F. Kennedy Boulevard West; John F. Kennedy Boulevard West between Danforth Avenue and Claremont Avenue; Claremont Avenue between Route 440 and John F. Kennedy Boulevard West; Route 440 between Claremont Avenue and Culver Avenue; and from the intersection of Culver Avenue and Route 440 continuing Northwest to the Hackensack River. Class A includes properties located on both sides of the boundary streets. The area of properties covered in Class C is generally comprised of the residential development community known as “Society Hill,” which includes the area known as “Droyers Point” within that community, and is generally bounded by Lee Court, Willow Street and Cottonwood Street to the West, Cherry Street to the South, Society Hill Drive North and Kellogg Street to the East and Lyon Court to the North. 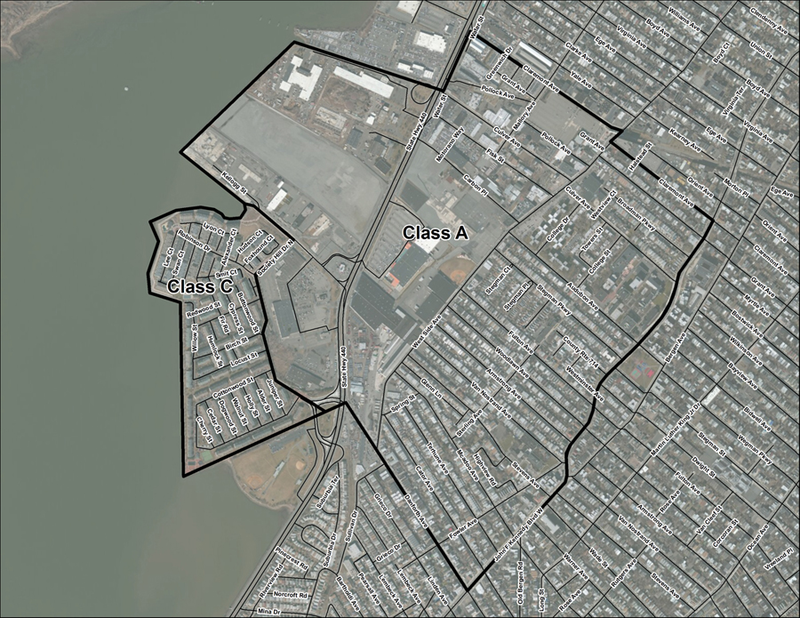 Settlement Class C includes properties located on both sides of the boundary streets contained in the class definition. If you are not sure if you are in the Class, you can call 1-844-322-8243 to see if your property is included in the Settlement. The Settlement will provide cash payments to those who qualify. The exact amount of any final payment to the property owners will depend on the Court’s award of attorneys’ fees and expenses, the costs of administration, and the number of eligible members participating. However, if all eligible properties participate, it is estimated that each eligible property would receive approximately $1,850 in payment. The amount any individual property owner receives will be calculated by the Claims Administrator and will be based on the duration of ownership during the period May 17, 2010 through October 1, 2014. If you were the sole property owner during this time period, you will receive the entire amount allocated to your property. If you owned the property during this period, but someone else owned the property either before or after you and also during this time period, payments for your property will be divided among you and the other owner. WHAT IF I DID NOT OWN MY PROPERTY FOR THE ENTIRE TIME? In order to be included in the Settlement, you must have owned your property at any time during the period May 17, 2010 through October 1, 2014. If you owned property during this period, but someone else owned the property either BEFORE OR AFTER YOU DURING THIS TIME PERIOD, payments for your property will be divided among you and the other owner based on the amount of time each person owned the property. WHAT IF I INHERITED MY PROPERTY? If you can demonstrate that you owned the property during the period May 17, 2010 through October 1, 2014 then you will be eligible to receive a payment. WHAT IF THERE ARE MULTIPLE OWNERS OF MY PROPERTY AT THE SAME TIME? If you file a valid claim, the Claims Administrator will write a single check payable to all co-owners of the property. The check will be mailed in care of the person to whom the notice was mailed. Unless you exclude yourself from the Settlement, you can’t sue, continue to sue, or be part of any other lawsuit against Honeywell to obtain any recovery for injury to property in the Settlement Class Areas as a result of the disposal, presence, or migration of COPR on, at or from the chromium sites known as Study Areas 5, 6, and 7 and Site 119. It also means that all of the Court’s decisions will bind you. TO RECEIVE A PAYMENT, YOU MUST FILL OUT A CLAIM AND RELEASE FORM and demonstrate that you own or owned property covered by the Settlement. You may submit your completed claim form via mail or by filing online. You can call 1-844-322-8243 to request that a form be sent to you. You must return the claim and release form by August 31, 2015. Please carefully read the Claim and Release Form. If you still have questions about it or the documentation it requests, you can call 1-844-322-8243. If you submit an incomplete Claim and Release Form or provide incomplete documentation, someone may reach out to you to get additional information. The Court held a hearing on September 24, 2015 at 11 a.m. to decide whether to give final approval to the Settlement. We are awaiting the Court’s decision. If the Court approves the Settlement, and the Claims Administrator has determined that you have a valid claim, you should expect to receive your payment within 15 days of when the Settlement becomes final. WHAT IF I DISAGREE WITH THE AMOUNT OF MY PAYMENT? You have the right to ask the Claims Administrator or the Court to reconsider the decision on your claim if you believe that the Claims Administrator has incorrectly calculated the amount of any payment. Please review the notice of payment carefully when you receive it because there are specific time limitations regarding the reconsideration process. More details are available in the Settlement Agreement, which is available here. If you don’t want a payment from the Settlement, and you want to keep the right to sue Honeywell on your own about the issues in this case, then you must have excluded yourself from the Settlement. The deadline to exclude yourself was August 31, 2015. IF I DIDN’T EXCLUDE MYSELF, CAN I SUE HONEYWELL FOR THE SAME THING LATER? No. Unless you excluded yourself, you gave up the right to sue Honeywell for the claims that the Settlement resolves. IF I EXCLUDED MYSELF FROM THE SETTLEMENT, CAN I STILL GET A PAYMENT? No. You will not get any money from the Settlement if you excluded yourself from the Settlement. NATIONAL LEGAL SCHOLARS LAW FIRM, P.C. You will not be charged for these lawyers. Their fees will be paid out of the settlement fund, as explained below. If you want to be represented by your own lawyer, you may hire one at your own expense. The Court will decide how much Class Counsel will be paid. Class Counsel will ask the Court for an award to cover costs and expenses, as well as for a fee award of $2,504,250, or 25% of the total amount recovered for the Classes. Class Counsel will also request that $10,000 be paid to each of the two Class Representatives who helped the lawyers on behalf of the whole Class, for a total of $20,000. To review the attorneys’ request for fees in this case, click here. If you are a Class Member, you may have objected to the Settlement or to requests for fees and expenses by Class Counsel. The deadline to Object was August 31, 2015. Objecting is simply telling the Court that you don’t like something about the Settlement. You may have objected to the Settlement only if you did not exclude yourself from the Settlement. Excluding yourself from the Settlement is telling the Court that you don’t want to be part of the Settlement. If you excluded yourself from the Settlement, you have no basis to object to the Settlement because it no longer affects you. The Court held a Fairness Hearing at 11 a.m. on September 24, 2015, at the United States District Court for the District of New Jersey in Courtroom # 5A, before United States District Judge Esther Salas. At this hearing, the Court considered whether the Settlement is fair, reasonable, and adequate. The Court also considered how much to pay Class Counsel and the Class Representatives. After the hearing, the Court will decide whether to approve the Settlement. We do not know how long these decisions will take. If you do nothing you will be bound by what the court decides and you will give up your right to sue Honeywell for any of the claims in this lawsuit. You will also not get any money from the Settlement. Please do not contact the Court for further information.